The Australian frontier wars were a series of conflicts fought between Indigenous Australians and European settlers that spanned a total of 146 years. The first fighting took place several months after January 26, 1788 and the last clashes occurred as late as 1934. Queensland, by all accounts the most populated section of indigenous Australia, represents also the single bloodiest backdrop of the Australian colonial frontiers. Thus the records of Queensland document the most frequent reports of shootings and massacres of indigenous people, the three deadliest massacres on white settlers, the most disreputable frontier police force, and the highest number of white victims to frontier violence on record in any Australian colony. A recent study thus calculate indigenous fatalities caused by the Queensland Native Police Force alone to no less than 24,000, whereas most scholars accept an overall continental minimum of 20,000 such fatalities. However Queensland's Native Police was responsible for only a certain period and section of the violence on the Queensland frontier. Thus should the 24.000 prove to be true, we will have to face an Aboriginal frontier violent death toll in Queensland alone which by far exceeds 30,000. This problem naturally affects also the death toll on the European and settler side of the frontier. The continental death toll of Europeans and associates have thus been roughly estimated to between 2,000 and 2,500, yet we now have fairly solid evidence that Queensland alone accounted for an estimated 1,500 of these fatal frontier casualties. Far more devastating in their impact on the Aboriginal population, however, were the effects of disease, followed by infertility, loss of hunting ground, starvation and general despair, loss of pride, and the alcoholic 'remedy' for this devastation. There are powerful indications that small-pox epidemics may have impacted some Aboriginal tribes with depopulation in large sections of what is now Victoria, New South Wales and Queensland with up to 50% or more, even before the move inland from Sydney of squatters and their livestock. Then other diseases hitherto unknown in the Indigenous population—such as the common cold, flu, measles, venereal diseases and tuberculosis—made a second impact, significantly reducing their numbers and tribal cohesion, so limiting their ability to adapt and resist invasion and dispossession. In 1770 a British expedition under the command of then-Lieutenant James Cook made the first voyage by Europeans along the Australian east coast. On 29 April Cook and a small landing party fired on a group of Tharawal people who threatened them when they attempted to come ashore at Botany Bay. Two Tharawal men threw spears at the British, before fleeing in alarm after being fired on again. Cook did not make further contact with the Tharawal, but later established a peaceful relationship with the Kokobujundji people when his ship, HM Bark Endeavour, had to be repaired at present-day Cooktown. Cook, in his voyage up the east coast of Australia, observed no signs of agriculture or other development by its inhabitants. Some historians argue that under prevailing European law such land was deemed terra nullius or land belonging to nobody or land 'empty of inhabitants' (as defined by Emerich de Vattel). Cook claimed the east coast of the continent for Britain on 23 August 1770. The British Government decided to establish a prison colony in Australia in 1786. Under the European legal doctrine terra nullius classification Indigenous Australians' were not recognised as having property rights and territory could be acquired through 'original occupation' rather than conquest or consent. The colony's Governor, Captain Arthur Phillip, was instructed to "live in amity and kindness" with Indigenous Australians and sought to avoid conflict. However, other historians argue as an inhabited land annexed by Britain, colonists could be granted the right to occupy such areas of the annexed land that did not appear to be under cultivation or some other kind of development (such as a village or town) but were generally expected to respect the property rights of the original inhabitants. These historians contend that as, in European terms, property rights were principally exercised by the cultivation of land, the marking of boundaries and by the building of permanent buildings and settlements, the settlers did not believe that Indigenous Australians claimed property rights to the lands they roamed over. Instead, nomadic hunter-gatherers seemed, to the Europeans, to be concerned only with the right to hunt and kill the wild game, which was their principal source of food. Many of the violent incidents between white settlers and Aborigines seem to have occurred when Aborigines objected to settlers hunting wild game, rather than because the settlers were 'occupying' Aboriginal territory. Violence between Indigenous Australians and Europeans began several months after the First Fleet established Sydney on 26 January 1788. The local Indigenous people became suspicious when the British began to clear land and catch fish, and in May 1788 five convicts were killed and an Indigenous man was wounded. The British grew increasingly concerned when groups of up to three hundred Indigenous people were sighted at the outskirts of the settlement in June. Despite this, Phillip attempted to avoid conflict, and forbade reprisals after being speared in 1790. He did, however, authorise two punitive expeditions in December 1790 after his huntsman was killed by an Indigenous warrior named Pemulwuy, but neither was successful. During the 1790s and early 19th century the British established small settlements along the Australian coastline. These settlements initially occupied small amounts of land, and there was little conflict between the settlers and Indigenous peoples. Fighting broke out when the settlements expanded however, disrupting traditional Indigenous food-gathering activities, and subsequently followed the pattern of European settlement in Australia for the next 150 years. Indeed whilst the reactions of the Aboriginal inhabitants to the sudden arrival of British settlers were varied, they became inevitably hostile when their presence led to competition over resources, and to the occupation of their lands. European diseases decimated Indigeous populations, and the occupation or destruction of lands and food resources sometimes led to starvation. By and large neither the Europeans nor the Indigenous peoples approached the conflict in an organised sense, with the conflict more one between groups of settlers and individual tribes rather than systematic warfare, even if at times it did involve British soldiers and later formed mounted police units. Not all Indigenous Australians resisted white encroachment on their lands either, whilst many also served in mounted police units and were involved in attacks on other tribes. Regardless a pattern of frontier warfare emerges, with Indigenous resistance beginning in the 18th century and continuing into the early 20th century, belying the "myth" of peaceful settlement in Australia. Settlers in turn often reacted with violence, resulting in a number of indiscriminate massacres. It may be inaccurate, however, to depict the conflict as one sided and mainly perpetrated by Europeans on Indigenous Australians. Although many more died than Europeans, some cases of mass killing were not massacres but military defeats, and this may have had more to do with the technological and logistic advantages enjoyed by Europeans. Indigenous tactics varied, but were mainly based on pre-existing hunting and fighting practices—utilising spears, clubs and other primitive weapons. Unlike the indigenous peoples of New Zealand and North America, on the main they failed to adapt to meet the challenge of the Europeans, and although there were some instances of individuals and groups acquiring and using firearms, this was not widespread. In reality the Indigenous peoples were never a serious military threat, regardless of how much the settlers may have feared them. On occasions large groups attacked Europeans in open terrain and a conventional battle ensued, during which the Aborigines would attempt to use superior numbers to their advantage. This could sometimes be effective, with reports of them advancing in crescent formation in an attempt to outflank and surround their opponents, waiting out the first volley of shots and then hurling their spears whilst the settlers reloaded. Usually however such open warfare proved more costly for the Indigenous Australians than the Europeans. Central to the success of the Europeans was the use of firearms, however the advantages this afforded have often been overstated. Prior to the 19th century, firearms were often cumbersome muzzle-loading, smooth-bore, single shot weapons with flint-lock mechanisms. Such weapons produced a low rate of fire, whilst suffering from a high rate of failure and were only accurate within 50 metres (160 ft). These deficiencies may have given the Aborigines some advantages, allowing them to move in close and engage with spears or war clubs. However by 1850 significant advances in firearms gave the Europeans a distinct advantage, with the six-shot Colt revolver, the Snider single shot breech-loading rifle and later the Martini-Henry rifle as well as rapid-fire rifles such as the Winchester rifle, becoming available. These weapons, when used on open ground and combined with the superior mobility provided by horses to surround and engage groups of Indigenous Australians, often proved successful. The Europeans also had to adapt their tactics to fight their fast-moving, often hidden enemies. Strategies employed included night-time surprise attacks, and positioning forces to drive the Aborigines off cliffs or force them to retreat into rivers while attacking from both banks. Fighting between Indigenous Australians and European settlers was localised as Indigenous groups did not form confederations capable of sustained resistance. As a result, there was not a single conventional war, but rather a series of violent engagements and massacres across the continent. According to the historian Geoffrey Blainey, in Australia during the colonial period: "In a thousand isolated places there were occasional shootings and spearings. Even worse, smallpox, measles, influenza and other new diseases swept from one Aboriginal camp to another ... The main conqueror of Aborigines was to be disease and its ally, demoralisation". The Caledon Bay crisis of 1932–4 saw one of the last incidents of violent interaction on the 'frontier' of indigenous and non-indigenous Australia, which began when the spearing of Japanese poachers who had been molesting Yolngu women was followed by the killing of a policeman. As the crisis unfolded, national opinion swung behind the Aboriginal people involved, and the first appeal on behalf of an Indigenous Australian to the High Court of Australia was launched. Following the crisis, the anthropologist Donald Thompson was despatched by the government to live among the Yolngu. Elsewhere around this time, activists like Sir Douglas Nicholls were commencing their campaigns for Aboriginal rights within the established Australian political system and the age of frontier conflict closed. While this was the end of the Australian Frontier Wars it was not the end of the Australian Frontier itself as the NT and the ACT hadn't been classified as states which both remain territories to this day. Frontier encounters in Australia were not universally negative. Positive accounts of Aboriginal customs and encounters are also recorded in the journals of early European explorers, who often relied on Aboriginal guides and assistance: Charles Sturt employed Aboriginal envoys to explore the Murray-Darling; the lone survivor of the Burke and Wills expedition was nursed by local Aborigines, and the famous Aboriginal explorer Jackey Jackey loyally accompanied his ill-fated friend Edmund Kennedy to Cape York. Respectful studies were conducted by such as Walter Baldwin Spencer and Frank Gillen in their renowned anthropological study The Native Tribes of central Australia (1899); and by Donald Thompson of Arnhem Land (c.1935–1943). In inland Australia, the skills of Aboriginal stockmen became highly regarded. The first frontier war began in 1795 when the British established farms along the Hawkesbury River west of Sydney. Some of these settlements were established by soldiers as a means of providing security to the region. The local Darug people raided farms until Governor Macquarie dispatched troops from the British Army 46th Regiment in 1816. These troops patrolled the Hawkesbury Valley and ended the conflict by killing 14 Indigenous Australians in a raid on their campsite. Indigenous Australians led by Pemulwuy also conducted raids around Parramatta during the period between 1795 and 1802. 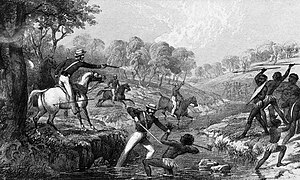 These attacks led Governor Philip Gidley King to issue an order in 1801 which authorised settlers to shoot Indigenous Australians on sight in Parramatta, Georges River and Prospect areas. Conflict began again when the British expanded into inland New South Wales. The settlers who crossed the Blue Mountains were harassed by Wiradjuri warriors, who killed or wounded stock-keepers and stock and were subjected to retaliatory killings. In response, Governor Brisbane proclaimed martial law on 14 August 1824 to end "...the Slaughter of Black Women and Children, and unoffending White Men...". It remained in force until 11 December 1824, when it was proclaimed that "...the judicious and humane Measures pursued by the Magistrates assembled at Bathurst have restored Tranquillity without Bloodshed...". There is a display of the weaponry and history of this conflict at the National Museum of Australia. This includes a commendation by Governor Brisbane of the deployment of the troops under Major Morisset: "I felt it necessary to augment the Detachment at Bathurst to 75 men who were divided into various small parties, each headed by a Magistrate who proceeded in different directions in towards the interior of the Country ... This system of keeping these unfortunate People in a constant state of alarm soon brought them to a sense of their Duty, and ... Saturday their great and most warlike Chieftain has been with me to receive his pardon and that He, with most of His Tribe, attended the annual conference held here on the 28th Novr...."
Brisbane also established the New South Wales Mounted Police, who began as mounted infantry from the third Regiment, and were first deployed against bushrangers around Bathurst in 1825. Later they were deployed to the upper Hunter Region in 1826 after fighting broke out there between Wonnarua and Kamilaroi people and settlers. Poster issued in Van Diemen's Land during the Black War implying a policy of friendship and equal justice for white settlers and Indigenous Australians. Such a policy did not actually exist at the time. The British established a settlement in Van Diemen's Land (modern Tasmania) in 1803. Relations with the local Indigenous people were generally peaceful until the mid-1820s when pastoral expansion caused conflict over land. This led to sustained frontier warfare (the 'Black War'), and in some districts farmers were forced to fortify their houses. Over 50 British were killed between 1828 and 1830 in what was the "most successful Aboriginal resistance in Australia's history". In 1830 Lieutenant-Governor Arthur attempted to end the 'Black War' through a massive offensive. In an operation which became known as the 'Black Line' ten percent of the colony's male civilian population were mobilised and marched across the settled districts in company with police and soldiers in an attempt to clear Indigenous Australians from the area. While few Indigenous people were captured, the operation discouraged the Indigenous raiding parties, and they gradually agreed to leave their land for a reservation which had been established at Flinders Island. The British made three attempts to establish military outposts in northern Australia. The initial settlement at Fort Dundas on Melville Island was established in 1824 but was abandoned in 1829 due to attacks from the local Tiwi people. Some fighting also took place near Fort Wellington on the Cobourg Peninsula between its establishment in 1827 and abandonment in 1829. The third British settlement, Fort Victoria, was also established on the Cobourg Peninsula in 1838 but was abandoned in 1849. The first British settlement in Western Australia was established by the British Army at Albany in 1826. Relations between the garrison and the local Minang people were generally good. Open conflict between Noongar and European settlers broke out in Western Australia in the 1830s as the Swan River Colony expanded from Perth. The Battle of Pinjarra is the best known single event, it was fought on 28 October 1833 between a party of British soldiers and mounted police led by Governor Stirling attacked an Indigenous campsite on the banks of the Murray River. The Noongar people forced from traditional hunting grounds and denied access to sacred sites turned to stealing settlers crops and killing livestock to supplement their food supply. In 1831 a Noongar person was killed taking potatoes this resulted in Yagan killing a servant of the household as was the response permitted under tribal law. In 1832 Yagan and two others were arrested and sentenced to death, settler Robert Menli Lyon argued that Yagan was defending his land from invasion as such he should be treated as a prisoner of war. The argument was successful and the three men were exiled to Carnac Island under the supervision of Lyon and two soldiers, the group later escaped from the island. Fighting continued on into the 1840s along the Avon River near York. In 1841 a massacre of all Ganeang men found, occurred in and around Lake Mininup, in the area of the Vasse and Blackwood. The discovery of gold near Coolgardie in 1892 brought thousands of prospectors onto Wangkathaa land, causing sporadic fighting. Continued European expansion in Western Australia led to further frontier conflict, Bunuba raiders also attacked European settlements during the 1890s until their leader Jandamarra was killed in 1897. Sporadic conflict continued in northern Western Australia until the 1920s, with a Royal Commission held in 1926 finding that at least eleven Indigenous Australians had been killed in the Forrest River massacre by a police expedition in retaliation for the death of a European. An illustration of the explorer Charles Sturt's party being "threatened by blacks (sic) at the junction of the Murray and Darling, 1830", near Wentworth, New South Wales. From the 1830s British settlement spread rapidly through inland eastern Australia, leading to widespread conflict. Fighting took place across the Liverpool Plains, with 16 British and up to 500 Indigenous Australians being killed between 1832 and 1838. The fighting in this region included several massacres of Indigenous people including as the Waterloo Creek massacre and Myall Creek massacres in 1838 and did not end until 1843. Further fighting took place in the New England region during the early 1840s. Fighting also took place in Victoria after it was settled by British in 1834. A clash at Benalla in 1838 marked the beginning of frontier conflict in the colony which lasted for fifteen years. The Indigenous groups in Victoria concentrated on economic warfare, killing tens of thousands of sheep. Large numbers of British settlers arrived in Victoria during the 1840s, and rapidly outnumbered the Indigenous population. By the late 1840s frontier conflict was limited to the Wimmera and Gippsland. Considerable fighting also took place in South Australia between 1839 and 1841. and in Queensland. Indeed, most conflict in the 1870s took place in western and north Queensland and northern Western Australia. The frontier wars were particularly bloody and bitter in Queensland. The reason behind this is obvious as Sir George Bowen, Queensland’s first governor noted in a despatch to the Colonial Office in April 1860, that ‘the native tribes…are far more numerous and more formidable in Queensland than in any other portion of Australia.’ This point is emphasised in a recent study by Orsted-Jensen, which calculates the overall continental distribution of pre-contact Aboriginal people on the bases of two different and of each other independent sources; on the one hand the distribution reflected in various continental population estimates and on the other the continental distribution of actual tribes, tribal land and linguistic groups. In the first case Queensland alone comes out with 38.2% and in the second case Queensland comes out with 34.2%. Both calculations thus indicate that colonial Queensland accounted for upwards of one third of the entire indigenous population of pre-contact Australia. The invasion of what is now Queensland commenced as the Moreton Bay penal settlement from September 1824. It was initially located at Redcliffe but moved south to Brisbane River a year later. Free settlement began in 1838 but a wholesale invasion and settlement only really began with the great rush to take up the surrounding land in the Darling Downs, Logan and Brisbane Valley and South Burnett onwards from 1840, in many cases leading to widespread fighting and heavy loss of life. The conflict later spread north to the Wide Bay and Burnett River and Hervey Bay region, and at one stage the settlement of Maryborough was virtually under siege. Both sides committed atrocities, with settlers poisoning a large amount of Indigenous people, e.g. at Kilcoy on the South Burnett in 1842 and on Whiteside near Brisbane in 1847 and Indigenous warriors killing 19 settlers during the Cullin-La-Ringo massacre on 17 October 1861. Queensland's infamous Native Police Force was formed by the Government of New South Wales in 1848 and under the well connected first Commandant Frederick Walker. Central Queensland was particularly hard hit during the 1860s and frontier violence peaked on the northern mining frontier during the 1870s, most notably in Cook district and on the Palmer and Hodgkinson River goldfields, with heavy loss of Aboriginal lives and several well known massacres. Battle Camp and Cape Bedford belong amongst the best known massacres of Aboriginal people in Cook district, but they were certainly not the only ones. Raids conducted by the Kalkadoon held settlers out of Western Queensland for ten years until September 1884 when they attacked a force of settlers and native police at Battle Mountain near modern Cloncurry. The subsequent battle of Battle Mountain ended in disaster for the Kalkadoon, who suffered heavy losses. Fighting continued in north Queensland, however, with Indigenous raiders attacking sheep and cattle while native police mounted punitive expeditions. The frontier wars in Queensland was overall the bloodiest the history of Colonial Australia. The latest studies gives evidence to some fifteen hundred whites and associates killed at the Queensland frontier during the 19th century and strong indications suggest that upwards of 30 000 Aborigines were shot and otherwise killed at the Queensland frontier, sections of Central and North Queensland were particularly bad. The final battles of the Australian frontier wars took place in the Northern Territory. A permanent settlement was established at modern-day Darwin in 1869 and attempts by pastoralists to occupy Indigenous land led to conflict. This fighting continued into the 20th century, and was driven by reprisals against European deaths and the pastoralists' desire to secure their land. At least 31 Indigenous men were killed by police in the Coniston massacre in 1928 and further reprisal expeditions were conducted in 1932 and 1933. The existence of armed resistance to white settlement was generally not acknowledged by historians until the 1970s. In 1968 anthropologist W.E.H. Stanner wrote that historians' failure to include Indigenous Australians in histories of Australia or acknowledge widespread frontier conflict constituted a 'great Australian silence'. Works which discussed the conflicts began to appear during the 1970s and 1980s, and the first history of the Australian frontier told from an Indigenous perspective, Henry Reynolds' The Other Side of the Frontier, was published in 1982. Between 2000 and 2002 Keith Windschuttle published a series of articles in the magazine Quadrant and the book The Fabrication of Aboriginal History. These works argued that there had not been prolonged frontier warfare in Australia, and that historians had in some instances fabricated evidence of fighting. Windschuttle's claims led to the so-called 'History wars' in which historians debated the extent of the conflict between Indigenous Australians and European settlers. The frontier wars are not commemorated at the Australian War Memorial in Canberra. The Memorial argues that the Australian frontier fighting is outside its charter as it did not involve Australian military forces. This position is supported by the Returned and Services League of Australia but is opposed by many historians, including Geoffrey Blainey, Gordon Briscoe, John Coates, John Connor, Ken Inglis, Michael McKernan and Peter Stanley. These historians argue that the fighting should be commemorated at the Memorial as it involved large numbers of Indigenous Australians and paramilitary Australian units. ↑ Orsted-Jensen, Robert: Frontier History Revisited (2011). ↑ Butlin N.G. : Our Original Aggression: Aboriginal Populations of Southeastern Australia 1788–1850, London 1983. ↑ Dennis et al 1995, p. 11. ↑ Flood, Dr Josephine, The Original Australians: Story of the Aboriginal People, Allen & Unwin, 2006, p12, p36. ↑ 19.0 19.1 Kohen, J. L. (2005). "Pemulwuy (c. 1750 – 1802)". Australian Dictionary of Biography. Australian National University. http://adbonline.anu.edu.au/biogs/AS10389b.htm. Retrieved 12 July 2009. ↑ 21.0 21.1 Dennis et al (1995), p. 9. ↑ Dennis et al (1995), p. 12. ↑ Grey (1999), p. 31. ↑ Grey (1995), p. 12. ↑ Dennis et al (1995), p. 5. ↑ Grey (1999), p. 30. ↑ Dennis et al (1995), p. 12–13. ↑ Dennis et al (1995), pp. 7–8. ↑ Text of Proclamation ending Martial Law at National Library of Australia. ↑ Sir Thomas Brisbane to Earl Bathurst, Despatch No.18 per ship Mangles,Government House, N.S. Wales, 31 December 1824. ↑ "Governor Arthur's proclamation". National Treasures from Australia's Great Libraries. National Library of Australia. Archived from the original on 28 October 2010. http://web.archive.org/web/20101028155322/http://nationaltreasures.nla.gov.au/%3E/Treasures/item/nla.int-ex6-s52. Retrieved 5 November 2010. ↑ "Governor Daveys Proclamation to the Aborigines". Manuscripts, Oral History & Pictures. State Library of New South Wales. 2008. http://libapp.sl.nsw.gov.au/cgi-bin/spydus/FULL/PM/BSEARCH/27/442502,1. Retrieved 2009-06-19. ↑ Hasluck, Alexandra (1967). "Yagan ( – 1833)". Australian Dictionary of Biography. Canberra: Australian National University. http://www.adb.online.anu.edu.au/biogs/A020578b.htm. Retrieved 2008-11-04. ↑ Skinner, L.E. : Police of the Pastoral Frontier – Native Police, 1849–1859, Brisbane, St Lucia, 1975. ↑ Peacock, Matt (26 February 2009). "War memorial battle over frontier conflict recognition". The 7:30 Report. Australian Broadcasting Corporation. Archived from the original on 26 May 2009. http://web.archive.org/web/20090526162314/http://www.abc.net.au/7.30/content/2009/s2502535.htm. Retrieved 18 April 2009. Wikimedia Commons has media related to Australian frontier wars. Broome, Richard (1988). "The Struggle for Australia : Aboriginal-European Warfare, 1770–1930". In McKernan, M. and Browne, M. Australia Two Centuries of War & Peace. Canberra: Australian War Memorial. ISBN 0-642-99502-8. Coates, John (2006). An Atlas of Australia's Wars. Melbourne: Oxford University Press. ISBN 0-19-555914-2. Connor, John (2002). The Australian frontier wars, 1788–1838. Sydney: UNSW Press. ISBN 0-86840-756-9. http://books.google.com.au/books?id=JWE5r39Ed1oC. Connor, John (2008). "Frontier Wars". In Dennis, Peter et al. The Oxford Companion to Australian Military History (Second ed.). Melbourne: Oxford University Press Australia & New Zealand. ISBN 978-0-19-551784-2. Curthoys, Ann, Docker, John & Peters-Little,Frances (Ed): Passionate Histories: Myth, memory and Indigenous Australia, Aboriginal History Monograph 21, ANU-Press, 3 October 2011, 348 pages, ISBN 1-921666-64-1 (Estimates of 19th century Aboriginal Frontier death toll, see 'Part One, Massacres' chapter 1, The Country Has Another Past: Queensland and the History Wars by Raymond Evans). Dennis, Peter; et al (1995). The Oxford Companion to Australian Military History. Melbourne: Oxford University Press. ISBN 0-19-553227-9. Grassby, Al; Hill, Marji (1988). Six Australian Battlefields. St Leonards: Allen & Unwin. ISBN 1-86448-672-4. Grey, Jeffrey (2008). A Military History of Australia (Third ed.). Port Melbourne: Cambridge University Press. ISBN 978-0-521-69791-0. Macintyre, Stuart (1999). A Concise History of Australia. Cambridge Consise Histories (First ed.). Cambridge: Cambridge University Press. ISBN 0-521-62577-7. Reynolds, Henry (1995). The Other Side of the Frontier. Aboriginal resistance to the European invasion of Australia. Ringwood: Penguin Books Australia. ISBN 0-14-013040-3. Skinner, L.E. : Police of the Pastoral Frontier – Native Police, 1849–1859, Brisbane, St Lucia, 1975. Stanley, Peter (1986). The Remote Garrison. The British Army in Australia 1788–1870. Kenthurst: Kangaroo Press. ISBN 0-86417-091-2.